Like the 2007 Religious Landscape Study, the new survey shows a remarkable degree of churn in the U.S. religious landscape. If Protestantism is treated as a single religious group, then fully 34% of American adults currently have a religious identity different from the one in which they were raised, which is up six percentage points since 2007. If the three major Protestant traditions (evangelical Protestantism, mainline Protestantism and historically black Protestantism) are analyzed as separate categories, then the share of Americans who have switched religions rises to 42%.16 And these figures do not include an estimate of the number of “reverts” (people who leave their childhood religion before returning to it later in life). If the survey had measured this category, the estimates of the number of people who have switched religions would be higher still. Along with other sources of change in the religious composition of the U.S. (like immigration and differential fertility or mortality rates), understanding patterns of religious switching is central to making sense of the trends observed in American religion. And perhaps the best way to assess the impact of switching on the composition of the U.S. religious landscape is to consider the ratio of the number of people who have joined each religious group to the number of people who have left. After all, every religious tradition ultimately loses some of the people who were raised within its fold, and every tradition (including the unaffiliated) gains some members who join its ranks after having been raised in a different group. By contrast, both Catholicism and mainline Protestantism, the two groups whose shares of the overall population have declined most sharply in recent years, have lost more members to religious switching than they have gained. Among U.S. adults, there are now more than six former Catholics (i.e., people who say they were raised Catholic but no longer identify as such) for every convert to Catholicism. And there are approximately 1.7 people who have left mainline Protestantism for every person who has joined a mainline denomination. This chapter examines the religious groups that experience net gains and losses from changes in religious affiliation and documents the high degree of turnover among American religious groups. In addition, it analyzes the patterns of membership gain, loss and retention among religious groups. The chapter also details the survey’s findings about interfaith marriage, which suggest that religious intermarriage is becoming more common. In fact, people who have gotten married since 2000 are about twice as likely to be in religious intermarriages as are people who got married before 1960. No religious group is only losing members or gaining members. Rather, each religious group is simultaneously gaining and losing members. Examining the total number of people entering and leaving each religion provides the most complete picture of the dynamism of the American religious landscape. In contrast with the unaffiliated, Catholicism has experienced the greatest net losses due to religious switching. Nearly a third of all U.S. adults (31.7%) were raised Catholic, and most of them continue to identify as Catholics today. But nearly 13% of all Americans are former Catholics – people who no longer identify with the faith despite having been raised in the Catholic Church. By comparison, there are far fewer converts to Catholicism; 2% of all U.S. adults now identify as Catholics after having been raised in another religion or without a religion. 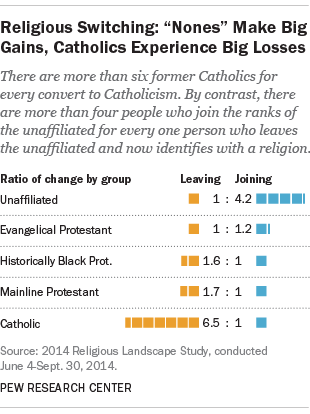 This means that there are more than six former Catholics for every convert to Catholicism. 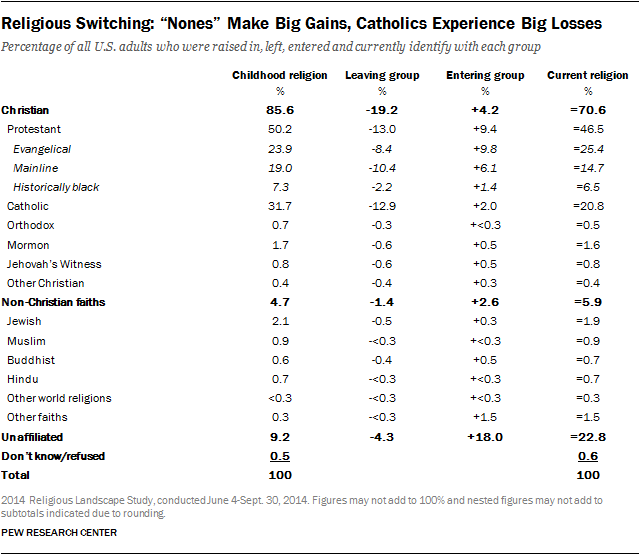 No other religious group analyzed in the survey has experienced anything close to this ratio of losses to gains via religious switching. Mainline Protestantism also has lost more members than it has gained through religious switching. Overall, 10.4% of adults are former mainline Protestants, compared with 6.1% who now identify with mainline Protestantism after having been raised in another faith. Driven primarily by the losses experienced by Catholicism and mainline Protestantism, Christianity as a whole loses more adherents than it gains via religious switching. The vast majority of U.S. adults (85.6%) say they were raised as Christians. But more than a fifth of them (19.2% of all adults) no longer identify with Christianity. Far fewer Americans (4.2% of all adults) have converted to Christianity after having been raised in another faith or with no religious affiliation. Overall, there are more than four former Christians for every convert to Christianity. Within Christianity, the major exception to this pattern is evangelical Protestantism, which gains more adherents through religious switching than it loses. Overall, nearly a quarter of U.S. adults (23.9%) say they were raised as evangelical Protestants. More than a third of them (8.4% of all adults) no longer identify with evangelicalism. But even larger numbers (9.8% of all adults) now identify with evangelical Protestantism after having been raised outside the tradition. 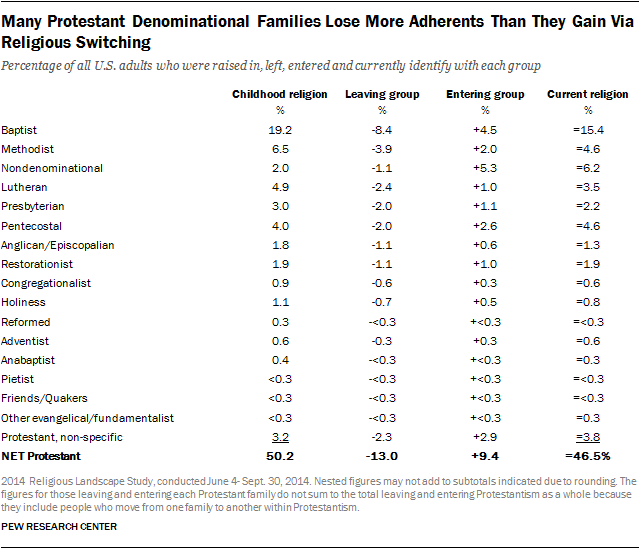 Many Protestant denominational families lose more people through religious switching than they gain. Nearly one-in-five American adults, for example, were raised Baptist (19.2%). But more than four-in-ten of them (8.4% of all U.S. adults) are no longer Baptist. Fewer people (4.5% of all adults) now identify as Baptist after having been raised in another religion, meaning that there are roughly two former Baptists for each person who has become a Baptist after having been raised in another religion or without a religion. The survey finds similar rates of losses to gains (roughly 2-to-1) for Methodists, Lutherans, Presbyterians, Episcopalians and Congregationalists. Nondenominational Protestants, by contrast, gain more adherents through religious switching than they lose. Just 2% of Americans say they were raised as nondenominational Protestants, and half of them (1.1% of all adults) no longer identify with nondenominational Protestantism. But 5.3% of adults now identify as nondenominational Protestants after having been raised in another religion or in no religion, meaning that nondenominational Protestantism gains roughly five adherents through religious switching for every adherent it loses. Hindus, Muslims and Jews are the three religious traditions that retain the largest shares of the adherents raised within their group. Among all U.S. adults who say they were raised as Hindus, fully 80% continue to identify with Hinduism as adults; most of those who no longer identify as Hindus now describe themselves as unaffiliated. Roughly three-quarters of those raised as Muslims (77%) and Jews (75%) also continue to identify with their childhood faiths. Among Christian groups, the historically black Protestant tradition retains the highest percentage of its childhood members, followed by evangelical Protestants and Mormons. Seven-in-ten respondents who were raised within the historically black Protestant tradition continue to identify with it today, while roughly two-thirds of those raised as evangelicals (65%) and Mormons (64%) continue to identify with their childhood faiths. Among those who have left the historically black Protestant and evangelical traditions, there are more people who now identify with other religions than who identify with no religion. By contrast, most former Mormons (21% of all adults who were raised as Mormons) now say they have no religious affiliation. Catholicism’s retention rate has slipped since the first Religious Landscape Study was conducted in 2007. At that time, 68% of respondents who were raised Catholic continued to identify as such as adults. Today, 59% of those raised Catholic still identify with Catholicism as adults, while 41% do not. One-in-five people who were raised Catholic now say they have no religious affiliation, while 10% identify with evangelical denominations, 5% with mainline denominations and smaller numbers with other faiths. Just over half of those who were raised with no religious affiliation (53%) still identify as religious “nones,” one of the lower retention rates among religious traditions. The low retention rate of the religiously unaffiliated may seem paradoxical, since they ultimately obtain bigger gains through religious switching than any other tradition. Despite the fact that nearly half of those raised unaffiliated wind up identifying with a religion as adults, “nones” are able to grow through religious switching because people switching into the unaffiliated category far outnumber those leaving the category. A quarter of those raised as mainline Protestants have become “nones,” along with 20% of those raised Catholic, 15% of those raised in the evangelical Protestant tradition and 13% of those raised in the historically black Protestant tradition. The data show, furthermore, that the share of those raised as “nones” who remain unaffiliated as adults is growing. Compared with 2007, the retention rate of the religiously unaffiliated has increased by seven percentage points (from 46% to 53%). This is driven, in large part, by generational replacement; young adults who were raised as “nones” are far more likely than their counterparts in previous generations to continue to identify as unaffiliated. 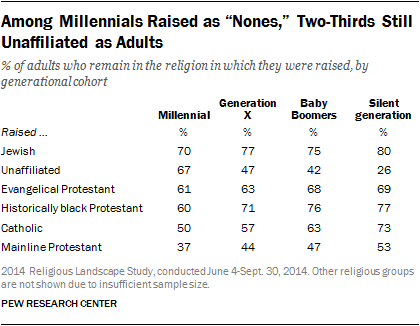 Fully two-thirds of Millennials who were raised unaffiliated continue to identify as “nones” as adults. In fact, “nones” have among the highest retention rates among Millennials, significantly higher than the comparable rates for those raised in the evangelical Protestant (61%), historically black Protestant (60%), Catholic (50%) and mainline Protestant (37%) traditions and about equal to the retention rate for Jews (70%). (The survey included too few interviews with people raised in other faiths to permit a similar analysis by generational cohort.) Among older generations, by contrast, far fewer people who were raised as religious “nones” remain religiously unaffiliated as adults. Of course, it is possible that growing numbers of Millennials who were raised unaffiliated will begin to identify with a religion as they get older, settle down, get married and have children. However, previous research suggests that generational cohorts typically do not become more religiously affiliated as they get older. Indeed, the current study suggests that most generational cohorts are becoming less religiously affiliated as they age. The 2014 Religious Landscape Study finds that 57% of all adults who were raised as Baptists continue to identify as Baptists. Anabaptists (52%), Lutherans (51%), Adventists (51%) and Pentecostals (50%) retain the allegiance of about half of their childhood adherents. 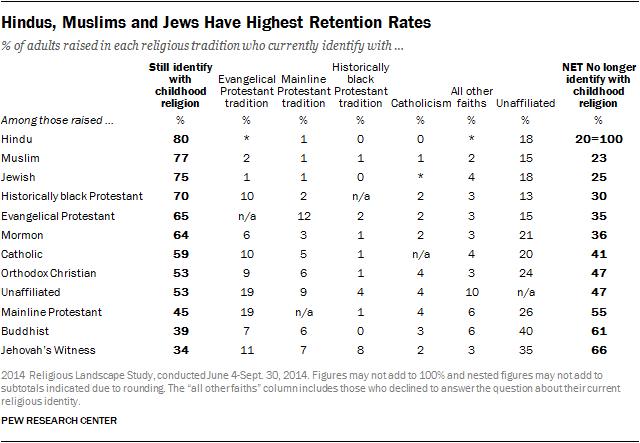 Many other Protestant denominational families have lower retention rates. 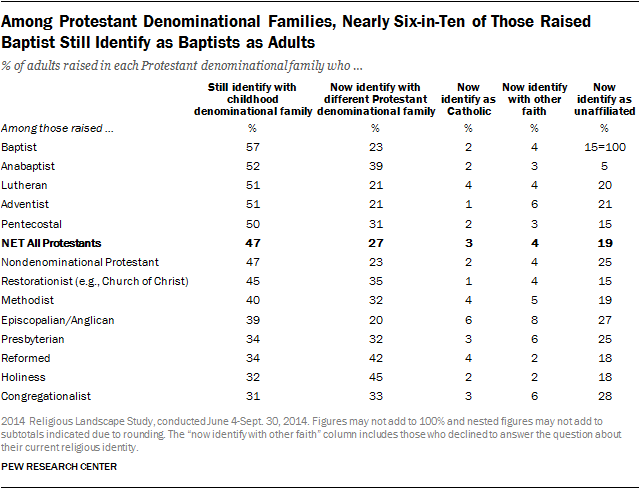 Four-in-ten or fewer of those raised as Methodists (40%), Episcopalians (39%), Presbyterians (34%), Reformed Protestants (34%), Holiness Protestants (32%) and Congregationalists (31%) continue to identify with those denominational families as adults. The flip side of examining retention rates (which show the groups that are most successful at holding on to those raised in their ranks) is to consider which groups are most heavily made up of people who have switched into the group. Nearly eight-in-ten adults who currently identify as religious “nones” were raised in a religion, while just 21% were raised religiously unaffiliated. Among adults who currently have no religious affiliation, there are more former Catholics (28%) and about as many former mainline Protestants (21%) as there are people who were raised with no religious affiliation (21%). Most people who currently identify as Jehovah’s Witnesses (65%) also were raised outside that tradition. And 67% of the Buddhists surveyed indicate that they were raised in a religion other than Buddhism or with no religious affiliation. However, since the survey was conducted only in English and Spanish, Buddhists who speak other languages (e.g., Vietnamese, Japanese or other Asian languages), and who are not comfortable taking a survey in either English or Spanish, are underrepresented. The Pew Research Center’s 2012 survey of Asian Americans indicates that most Asian-American Buddhists were raised as Buddhists. At the other end of the spectrum, fully 90% of adult Catholics are “cradle Catholics” raised in the church. Similarly, 90% of Hindus say they were raised as Hindus. Within Protestantism, roughly six-in-ten evangelical Protestants (61%) and mainline Protestants (58%) say they were raised within their respective traditions. Each group includes substantial minorities, however, who were raised in the other faith; 14% of current evangelical Protestants were raised in the mainline tradition, and 20% of mainline Protestants were raised in the evangelical tradition. Each group also includes sizable numbers of former Catholics, with 13% of current evangelical Protestants and 12% of current mainline Protestants indicating that they were raised Catholic. Compared with evangelicals and mainline Protestants, the historically black Protestant tradition includes fewer people who have switched in from a different religious background. Interfaith relationships are common among married people and those living with a romantic partner, and interfaith marriage appears to be on the rise. 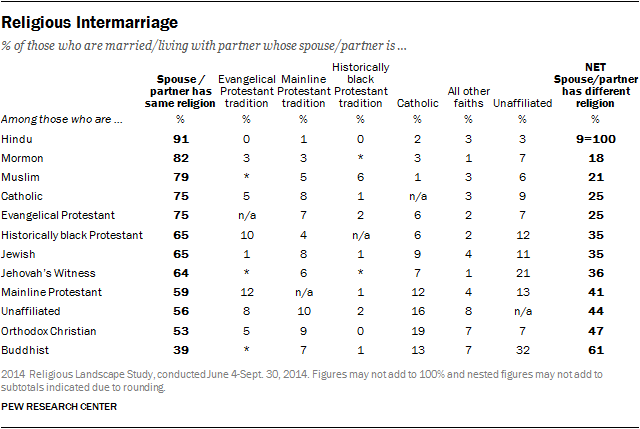 If Protestantism is treated as a single religious group, then 28% of American adults who are married or living with a partner have a spouse or partner with a religion different than their own. When the three major Protestant traditions (evangelical Protestantism, mainline Protestantism and historically black Protestantism) are analyzed as separate categories, the number rises to 33%. These patterns strongly suggest that intermarriage has been rising, but it also should be noted that some research indicates that “in-marriages” (marriages between people of the same religion) tend to be more durable than intermarriages.18 The Religious Landscape Study does not measure whether couples were in religiously mixed marriages at the time they got married; these marriages would no longer be counted as interfaith relationships if one or both spouses switched religions and they now share the same faith. If it were possible to analyze these other types of mixed marriages (i.e., those that ended in divorce and those that now are religiously matched marriages due to religious switching), then the percentage of intermarriages in previous decades may have been higher than it appears because the study only looks at marriages that are intact today. The apparent rise of religious intermarriage is driven in large part by marriages between Christians and religiously unaffiliated spouses. Fully 18% of people surveyed who have gotten married since 2010 are either Christians with a religiously unaffiliated spouse or religious “nones” with a Christian spouse, as are 16% of people who got married between 2000 and 2009. By comparison, just 5% of people surveyed who got married before 1960 fit this profile. 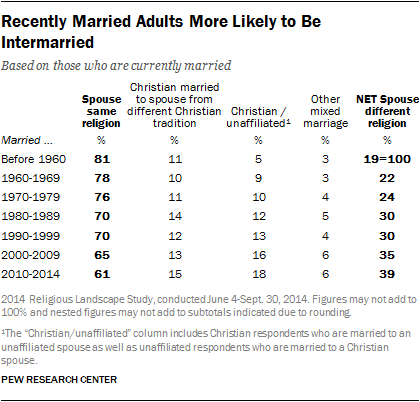 The rates of intra-Christian mixed marriage (e.g., between an evangelical Protestant and a mainline Protestant, or between a Catholic and a Mormon) are closer among those who got married recently and those who have been married for a long time. Among those surveyed who are married or living with a partner, Buddhists are more likely than members of most other groups to indicate that they are in a mixed-faith relationship, with fully six-in-ten Buddhists (61%) saying their spouse or partner has a religion other than Buddhism. However, Asian-American Buddhists are underrepresented in the study because the survey was conducted only in English and Spanish and not in Asian languages such as Japanese, Mandarin or Vietnamese. In the current study, just 33% of Buddhists identify their race as Asian American. But the Pew Research Center’s 2012 survey of Asian Americans (conducted in English and seven Asian languages) found that roughly two-thirds of all U.S. Buddhists are Asian Americans, and that most married Asian-American Buddhists are married to a spouse who is also Buddhist. Thus, the 2014 Religious Landscape Study’s estimated intermarriage rate for Buddhists is likely much higher than it would have been had the survey been offered in Asian languages (and included more Asian-American Buddhists). Hindus are more likely than any other religious group to have a spouse or partner with the same religion (91%). Roughly eight-in-ten Mormons (82%) and Muslims (79%) who are married or living with a partner have a mate who shares their religion, as do three-quarters of Catholics and evangelical Protestants.